We love our wine club members, they are a creative lot with impeccable tastes in food and wine. Some, like Erin Segreto of Cathedrals and Cafés even share their own tips and tricks for pairing our wines. 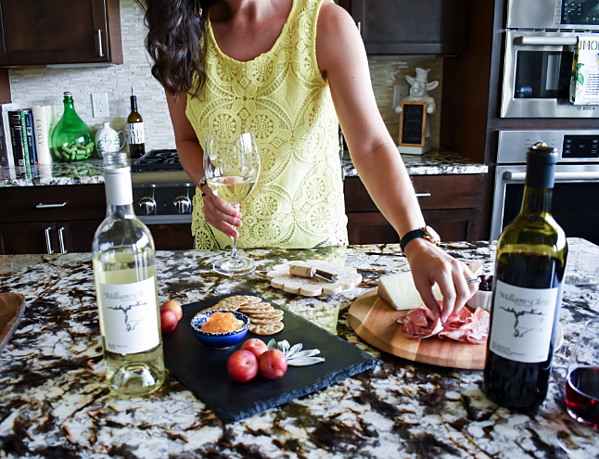 You can subscribe to Erin's blog for updates on our current releases, but we wanted to share a few of her yummy, n0-fuss recommendations for entertaining guests with a wine and cheese spread that is suitable for the Texas summer's triple digit heat. Why pair cheese and charcuterie with wine? Erin says, "When done right they look beautiful enough to impress even the toughest guest. They can be served as an appetizer or even be a complete meal. Throw in some exceptional wine and you may never get me to leave. This is the way to my heart, peeps." We are pleased to share two easy to make cheese boards for pairing with William Chris Vineyards Texas-grown wines. We love how she encourages her readers to be creative because, "There really aren’t any hard rules when it comes to food composition (just have fun with it)..."
Top the goat cheese with orange marmalade and serve with black pepper crackers. The citrus flavor of the marmalade tempers the tartness of the cheese. The 2017 Mary Ruth is pretty fruit forward, but not sweet. It’s more bright in the way a citrus fruit would be. I like how the black pepper in the crackers spices up all that fruit. The Mary Ruth is ready to be enjoyed now or can be cellared for a couple more years. The beauty of a cheese like manchego is that because it’s a hard cheese, your local cheese shop will slice it into nice wedges, which look great on your board. It has a creamy texture and a mild sharpness. Dry coppa is one of my favorite cured Italian meats, so it’s my easy go to. But Jamón Ibérico is really what you want if you can find it. A small bowl of olives keep juices tidy. This board has some stronger flavors and needs a wine that can stand up to them. The 2016 Enchanté is a brilliant blend of some of Texas’ best grape varietals. This wine always impresses me – nice to meet you indeed. It has the body I expect from a great Cab, but it’s incredibly smooth. I usually want to eat alllll the meats with it. That’s why the addition of charcuterie to the cheese board is a must! Toss out some dark chocolates if you want, too, because this wine has notes of blackberries and dark cherry. It’s a wine that will carry you through an entire meal from start to finish. A few simple pairing alternatives to consider for your boards: almonds and walnuts, chutneys, fruit spreads, French bread or breadsticks, berries, raw honey, pickled vegetables, and sun-dried tomatoes. We encourage you to read the complete article and be sure to subscribe to Erin's blog for more tips on entertaining your friends with Real. Texas. Wine. Cheers!